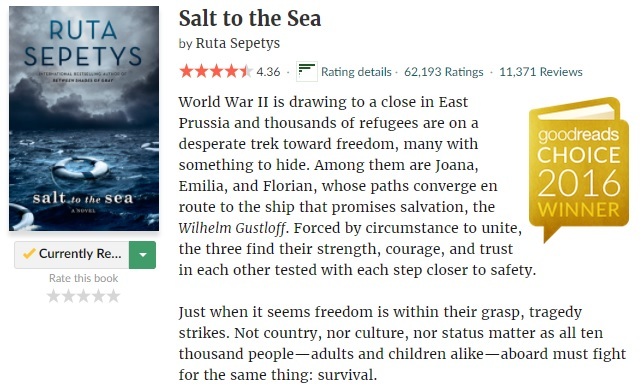 I’m finally reading Salt To The Sea by Ruta Sepetys! I’m a big fan of her other novels, so I’m still not sure why it took me this long to actually pick up this title. I’m having very high hopes for this one, so fingers crossed it will be another good one. This entry was posted in Book Memes, Teaser Tuesdays and tagged book memes, ruta sepetys, salt to the sea, teaser tuesdays by Yvo. Bookmark the permalink. I’m listening to Station Eleven at the moment and really enjoying it. I can see why people love it! I own this one, but haven’t yet read it. I’m reading Rainbirds and Then She Was Gone by Lisa Jewell! Enjoying both so much. I am loving it so far (now at 50%) and it is getting to be unputdownable. Love to hear what you think if you read it! Everyone I know adores Sepetys but man am I never in the mood for Historical Fiction hah. Yeah I can understand that.. Don’t pick up her books if you’re not in the mood for historical fiction! Out Of The Easy is the ‘easiest’ one to read though of the three. I can’t wait to read this one! I hope you enjoy it! I’m finishing up Crossroads and the Himalayan Crystals. This one sounds really good though must be an emotional read. I hope that you will enjoy it. It was without doubt emotional, but very well written and fascinating! Not as much a tearjerker as I was expecting.